CityStrap is an incredibly beautiful and fully responsive Bootstrap 3 Template for any type of creative web professional. It is developer friendly, easy to customize and ready to go! It works on all main web browsers, tablets and phones. CityStrap is easy to navigate, with a user-friendly layout and developer friendly code. It features full responsive layout, css3 animations, a portfolio with filters and lightbox gallery. All future updates are free to download, once you have purchased CityStrap once. Enjoy! 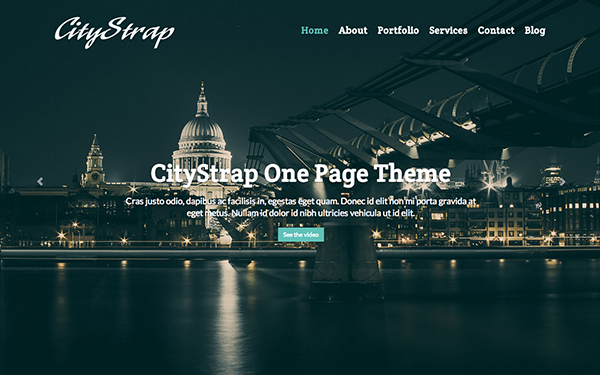 Item Reviewed: CityStrap One Page HTML5 Template (Bootstrap 3) 9 out of 10 based on 10 ratings. 9 user reviews.